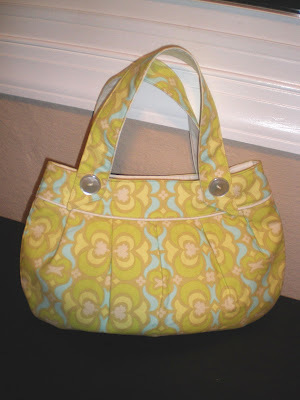 I just listed this bag in the shop. It's a larger version of my previous bags and can hold quite a bit. I really like this fabric and the colors are actually brighter than they are showing in the photos above. Crappy camera! I hope to have another bag finished up tonight-actually two. I've got a pretty cool reusable shopping bag made and want to make a little storage pouch to go along with it and sell them as a set. The reusable bag is HUGE and would be great for grocery runs, farmer's market trips, flea marketing, etc. 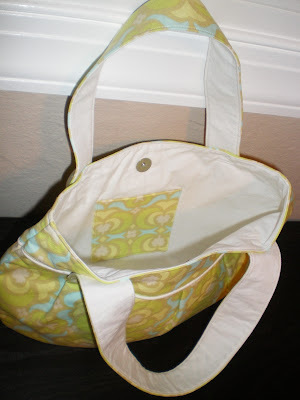 The storage pouch will have a zipper-you can either store your market bag in the zipper pouch and toss it into your purse OR carry the market bag as your purse and use the zipper pouch to organize your personal items. Also, I just got my hands on some wallet patterns and hope to add some of those as well. Now if I can manage to make a week 8 days long instead of 7. . . Have a great day!